I love being with Cadence everyday, but I also love getting things done. 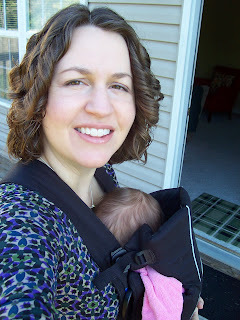 Since she likes to be held, and I like to hold her, I was so happy to find that she really likes the Baby Bjorn carrier. Whenever I put her in it, she usually falls asleep, listening to my heartbeat and feeling warm and cozy - and my hands are free! I took this picture last Sunday, but today I tried out a suggestion from a friend to use the Baby Bjorn at the grocery store. Cadie and I hadn't been to the grocery store by ourselves until today, and it was great! She slept, I shopped and I didn't have to worry about her being bothered the lights or the people. Oh! How Sweet! I am so happy this worked for you. Look at that little head. Wish I could hug and kiss her. She is so precious. Love this pictures of you.